This One Size Fits Always™ denim is designed to make you look and feel wonderful even if your weight changes. My Fit™ Jeans are made with Flex Tech Denim Technology that allow the jeans to conform to your unique body shape, size and height. 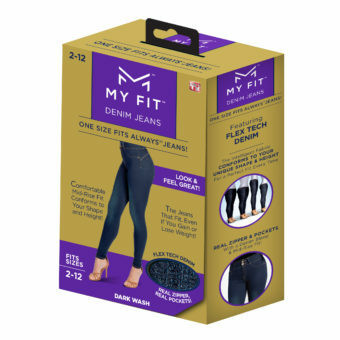 My Fit™ Jeans give you the perfect fit every time. My Fit™ Jeans have a real zipper, button and back pockets. My Fit™ Jeans are made with a denim blend, an attractive mid-rise, & a trendy skinny jean fit. Comes in 2 easy sizes – 2-12 or 14-20.